Ahh, probably the most requested ‘Greece Guide’ we have had so far! And who could you blame? 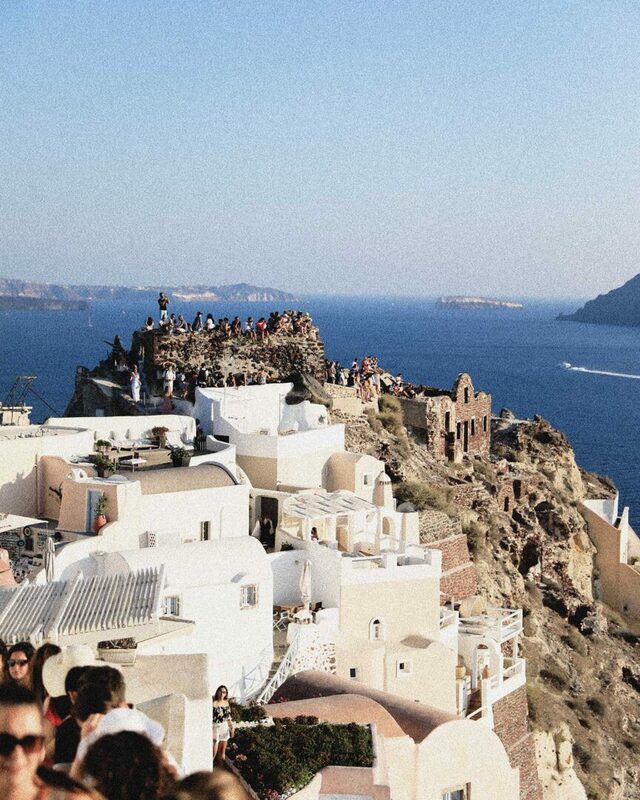 Santorini is one of the most instagrammable and popular locations of everyones Euro ’18 trip. Santorini is one of the most well-known Greek island, and visited by millions of tourists every year (a whopping 2mil were recorded for visiting in 2017 alone!) and isn’t yet losing it’s beautiful charm and Greek charisma. However if you’re planning to travel to Santorini we would highly suggest looking at visiting during an off-peak period (September-May) as you’ll find the experience much more relaxing and enjoyable. 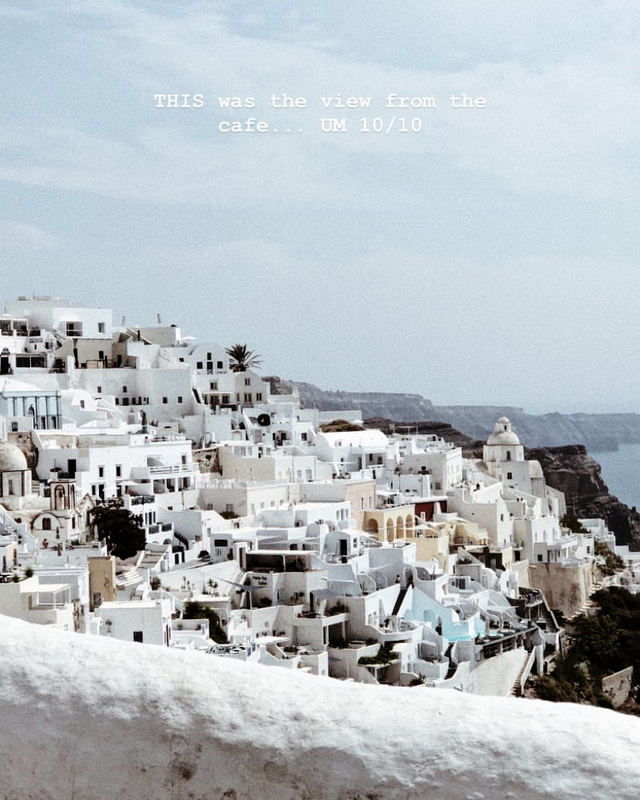 Bec and I have been to Santorini a total of three times and this will probably be our last ‘peak-season’ visit due to the sheer volume of tourists on the island. We first visited in 2007 and then again in 2013 and can say that both times enjoyed the atmosphere better than this time around. Don’t get us wrong; it was still breathtaking, stunning and a beautifully fun and exciting island to visit, however lost the ‘rugged-ness’ that we love about the Greek islands. Since we last visited in 2013 (only 5 years ago) Santorini has exploded with a multitude of new bars, boutiques, restaurants, souvenir shops and everything else you can think of. For tourists, it’s fantastic as there is so much to do in the main towns that you would never get bored, but for us who yes, although tourists, are Greek so technically locals, it makes us feel like we’ve “sold out” a bit for the sake of saving our economy. 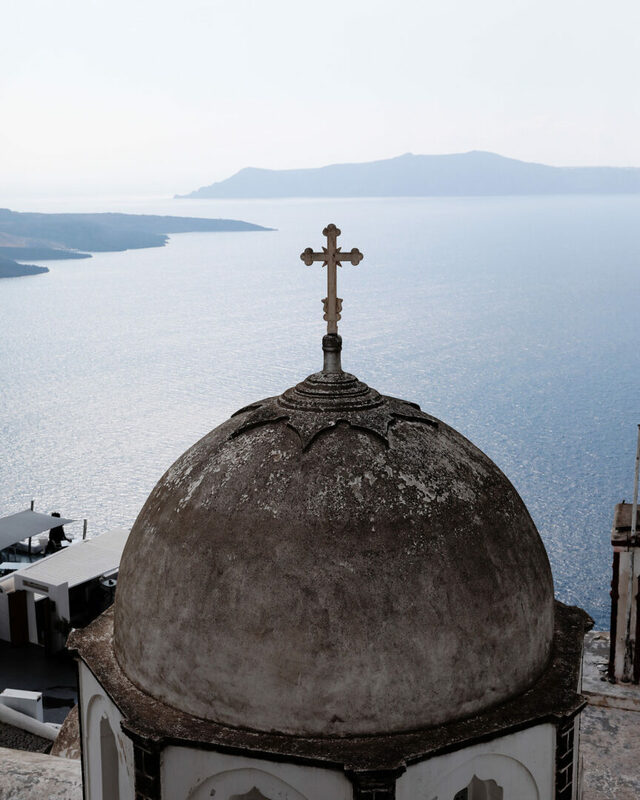 Don’t let us put a dampener on your next Santorini trip because we can absolutely guarantee you will love it all and have the best time enjoying all the beauty it has to offer, just bear in mind that it’s a busy island during the peak of Euro summer. Oia – not for the fainthearted because it’s chockers.com always. Even during the day, at siesta time or first thing in the morning, there are a LOT of people trying to fit in narrow streets and alleys. However a bonus is that you are really in the heart of the bougee Santorini with the best sunset spots and shops on the whole island. *Note* that a lot of the accomodation in the centre of Oia isn’t accessible by car, so you may have to lug your suitcase through said crowd of people for a couple of hundred meters to your accomodation. 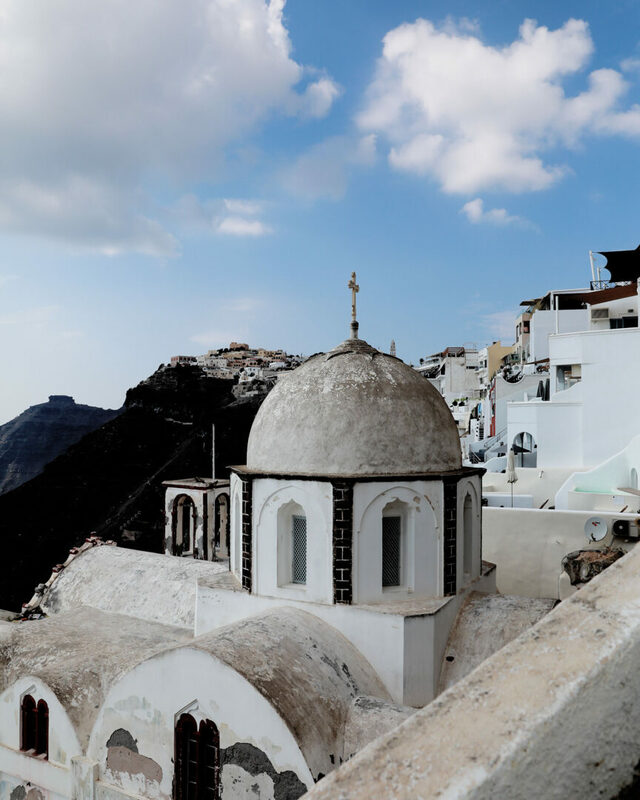 Fira (Thira) – is probably a little bit less busy than the popular Oia, however still a wonderful little town filled with great shops, boutiques and places to eat and drink! In our opinion, the sunset and view is just as good in Thira than it is in Oia! 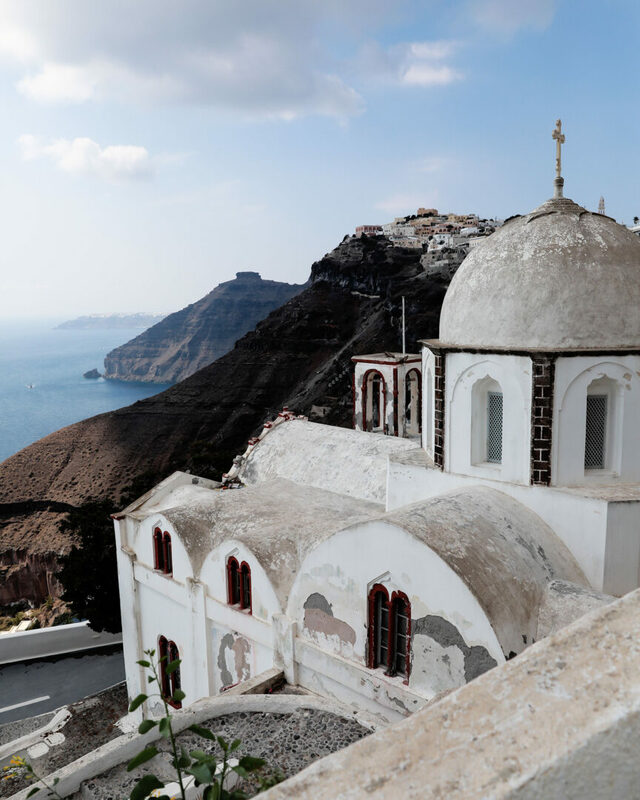 Thira is also very popular for younger travellers who are keen to head out after dark and enjoy the Santorini nightlife. 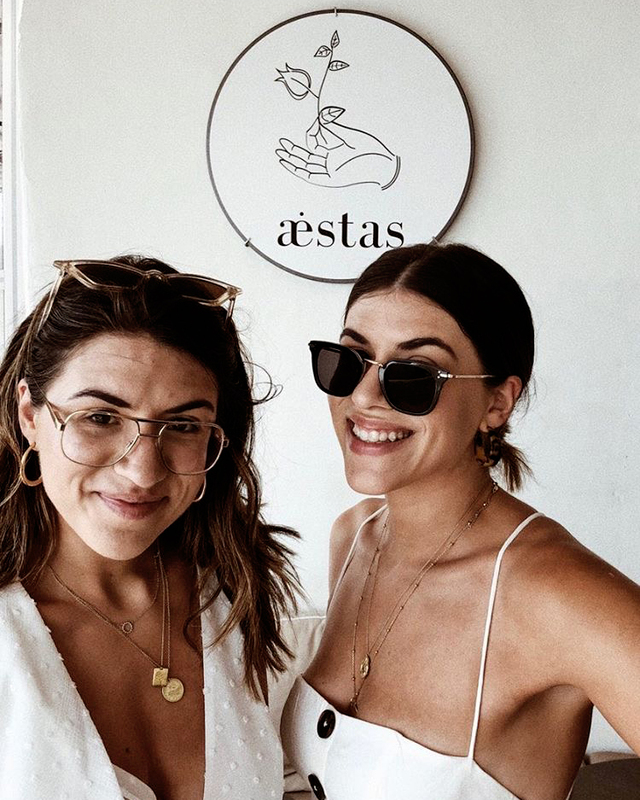 There are lots of bars and pubs around for grooving until sunrise (if you so desire), and fun traditional Greek jewellery stores to spend your hard earned cash at. 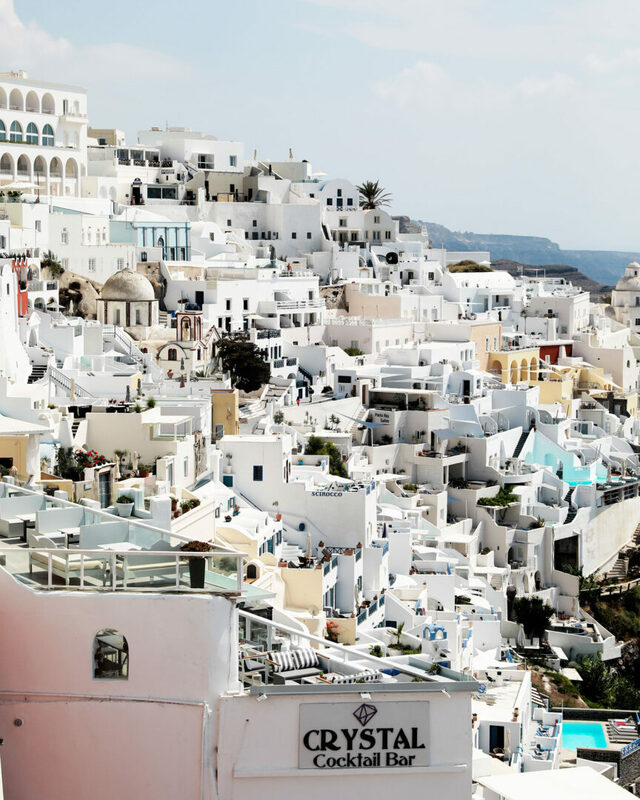 Firastefani – is the village one further out from Fira and is probably our favourite place to stay in terms of feeling like you’re away from the hustle and bustle of Fira or Oia, but you’re still close enough to walk down for a post-siesta shop. We last stayed in Firastefani in 2013 and it’s changed so much since then! Wayy more places to eat, drink and shop around with it really feeling like a ‘mini’ Fira. 10/10! 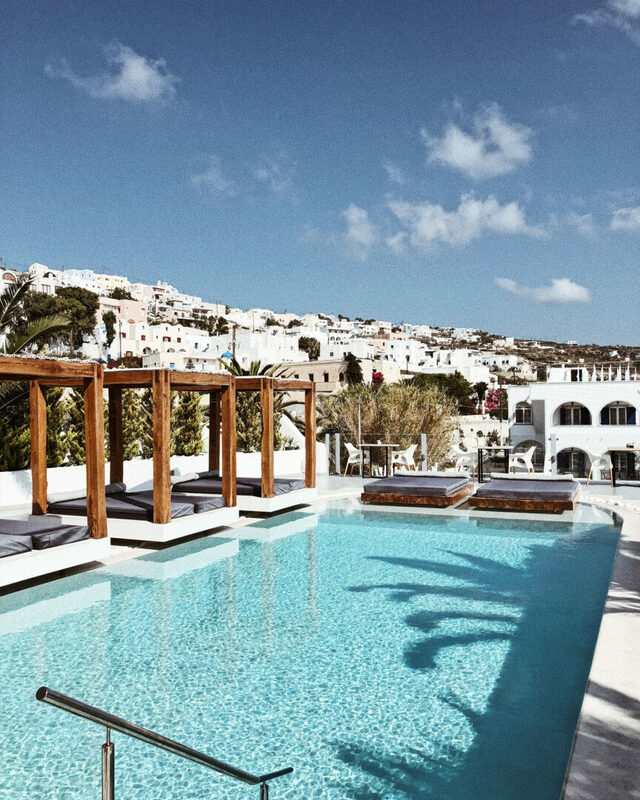 That being said, if you are going to stay in Thira, we highly recommend Callia Collection. It’s a short walk from Thira town but still far out enough to feel away from the business of the town and nightlife. ONE: Oia Sunset was obviously going to be on the list. Yes it was crowded and yes it was busy, but my goodness was it worth it! Such a beautiful town with an absolutely sensational sunset view. *Tip get there around 5pm to walk around and get the best position possible before the sun sets around 7:30-8pm! As we mentioned, it gets busy. ALSO remember if you’re not staying in Oia that all the taxi’s and buses will be found at the bus terminal in Oia. Make sure that you either have the bus timetable on your phone or know how to get to the bus terminal otherwise you may be stuck in Oia for the night! TWO: McDaniels for the best Gyros in Greece. Okay, maybe an overstatement, but it’s definitely the best gyros on the whole island – hands down. Have eaten there every time we have been in Santorini and it being well-known globally for it’s awesome gryos’ it is an absolute must. I say globally because all the Greeks in Melbourne know about it, and considering Melbourne has the biggest population of Greeks outside of the two major Greek cities – I’d say that’s a pretty good recommendation. It’s located in Fira town across from the Hondos Centre, however you can chuck McDaniels in your Google maps and it’ll come up. If you get a chicken gyros (preferred) it comes with mustard instead of tzatziki, all your usual gyros inclusions plus fat potato chips. Y U M M Y. There is something about the mustard and chicken combo that goes so well in a gyros, don’t ask us why, it’s just a vibe. The pork gyros is just as good but comes with the traditional tzatziki, but still has chips inside. They’re around €2.5 each and just the perfect any-time-of-the-day snack. We would have gotten a photo to insert into this blog post, but we ate them so quickly. Maybe why we’re not food bloggers? Lol. THREE: Walk around the Old Port or travel down on the Donkeys. We know this may be a point of contention for a lot of people recently, however many years ago we experienced travelling down to the Old Port at Thira on the Donkeys and it was super fun. There are many petitions and protests for fairer living/working conditions for many of the donkeys who travel up and down the many stairs carrying tourists – however the donkeys we looked at this year were hanging out under shade with fresh water and food and looked very healthy. We can’t say that’s the case for all, but can definitely say with confidence that it is the case for some. So please use your discretion if you would like to travel down to the Old Port via donkey. You can always walk your way down or travel via Cable Car as an alternative. FOUR: Aestas Cafe/Bar for a great view of Thira. It isn’t the top-top point of Thira where you can see the entire rolling buildings however you get a really amazing view in this cool cafe which turns into a bar in the evening. Great modern cuisine with amazing coffee and cocktails you cannot go wrong! It’s towards the Old Port route and just after a large section of tourist souvenir shops. We will definitely go back when we visit Santorini again! 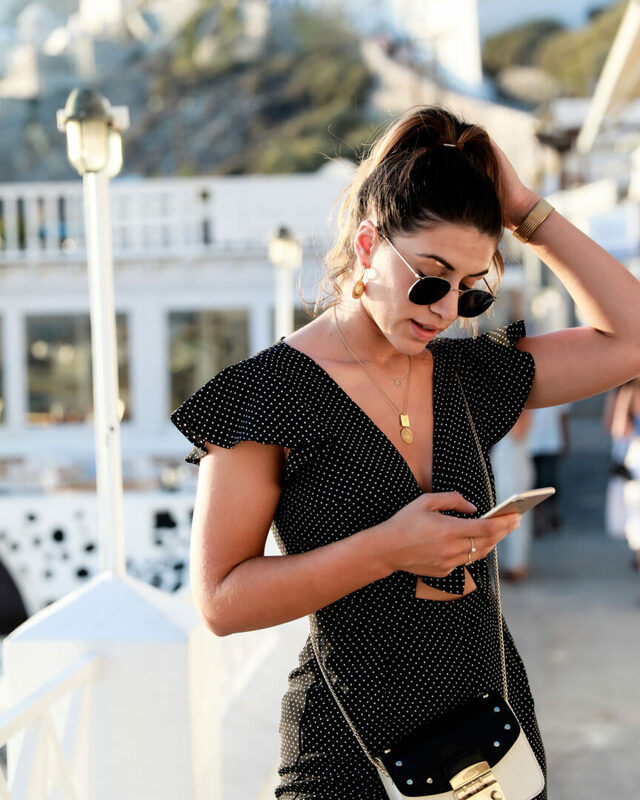 For more tips on what to do in Santorini, we suggest you also check out some of our fellow bloggers posts! Our beautiful friend Olivia from Olympia Creative wrote an amazingly comprehensive post (only Part 1 so far!) 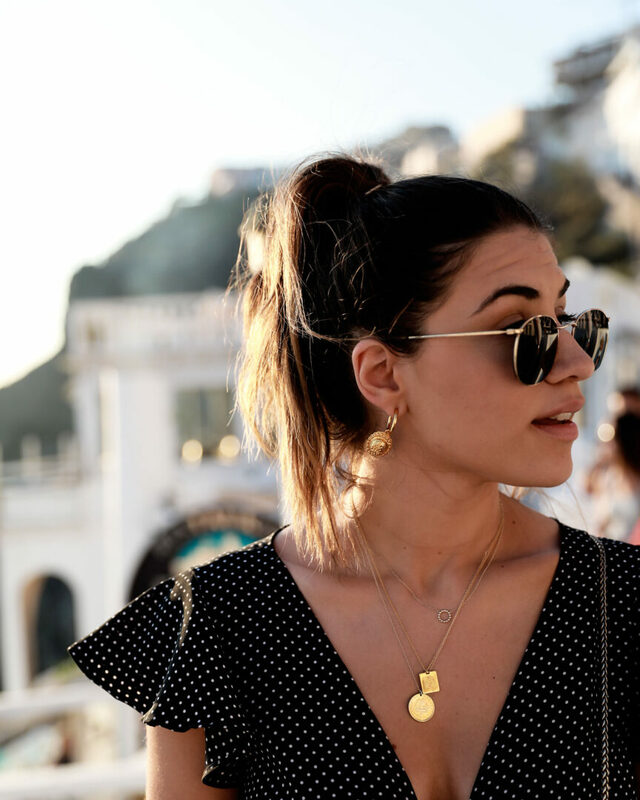 on Santorini here as well as the talented We The People Style’s Santorini guide here. 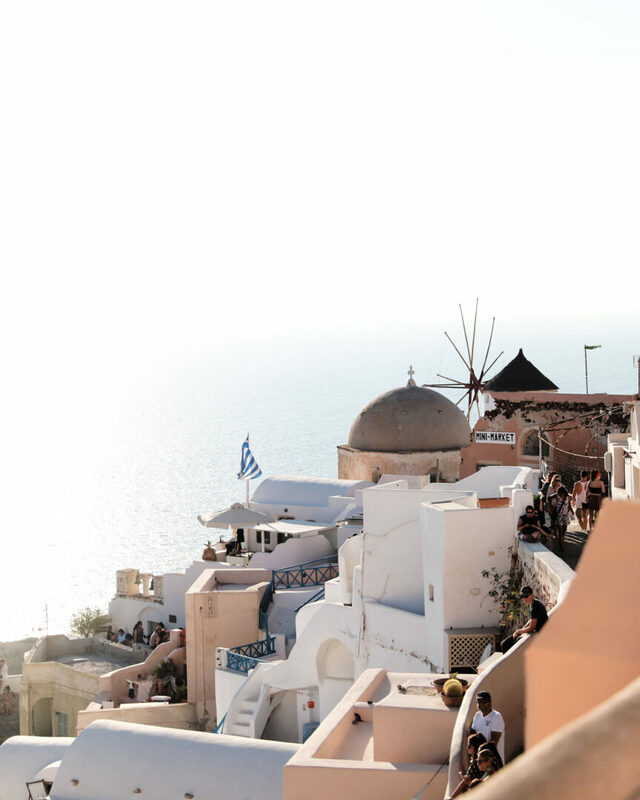 We also suggest checking out Base Colours Santorini Destination Guide for all things to eat, see and shop!